High Winds Raking The Guadalupe's. 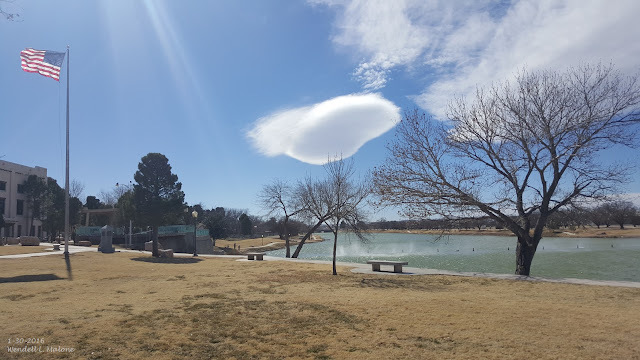 Strong winds aloft blowing across the Guadalupe Mountains yesterday created these mountain wave clouds or lenticular clouds southwest-west of Carlsbad, New Mexico. Blowing spray can also be seen coming up over the dam on the river as a result of these gusty southwesterly winds at the surface. High winds continue to howl across the Guadalupe Mountains early this Sunday morning. 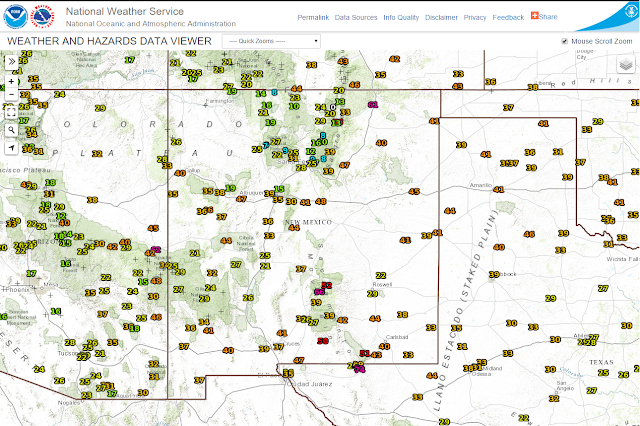 As of 4:30 AM MST the Bowl Raws located just north of Guadalupe Peak has already clocked a peak wind gust of 92 mph in the past 24 hours. 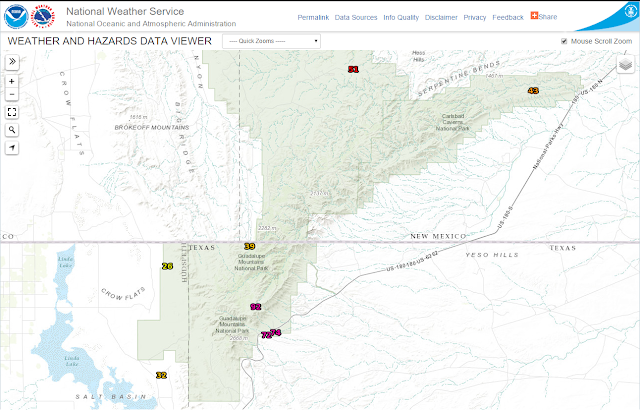 Guadalupe Pass last reported a peak gust of 79 mph. The ASOS was not reporting as of 4:30 AM MST this morning. Seems like this site goes down every time there is a high wind event up there. 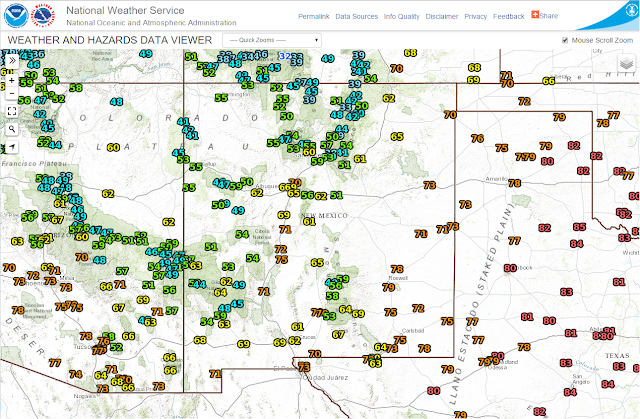 Pine Springs has reported a peak gust of 77 mph. Raton has clocked a gust of 70 mph at the airport and the Sierra Blanca Regional airport northeast of Ruidoso has recorded a peak gust of 66 mph. Additional peak wind gusts can be found via this link. San Augustine Pass east of Las Cruces in the Organ Mountains clocked a peak gust of 70 mph yesterday afternoon. 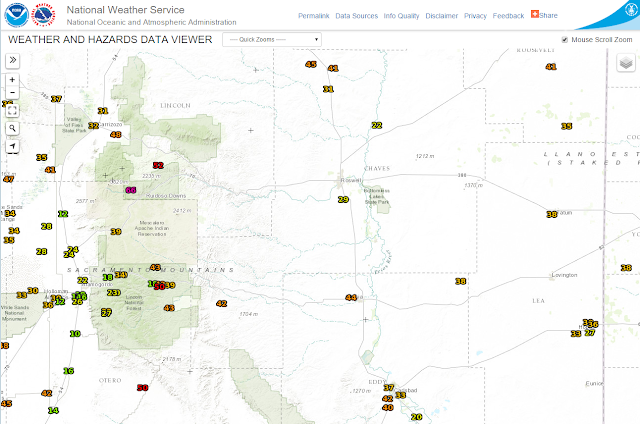 Click on this link for additional peak wind gusts yesterday across southern new Mexico. Reported High Temperatures On Saturday. Another Very Warm & Windy Day. Today will be as warm as yesterday if not a few degrees warmer in a few spots. Most of the local area will see high temps in the mid-upper 70's with a few 80-degree readings possible. 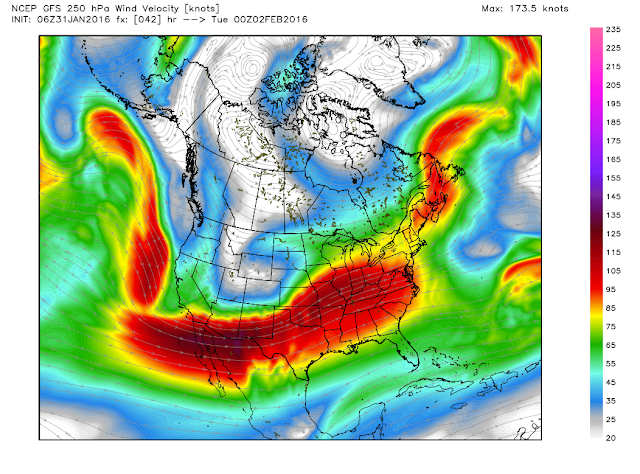 GFS 250 MB (34,000' Mean Sea Level/MSL) Jet Stream Forecast. 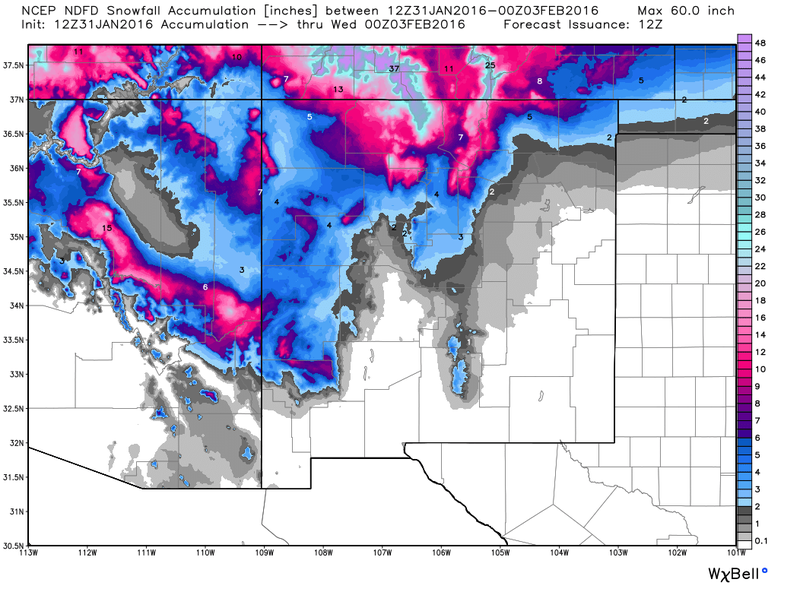 Valid @ 5 PM MST Monday, February 1, 2016. 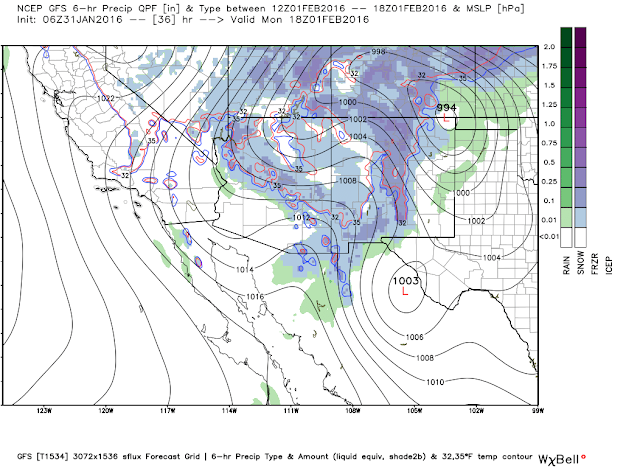 GFS 500 MB (18,000' Mean Sea Level/MSL) Forecast. NAM 700 MB (10,000' Mean Sea Level/MSL) Wind Forecast. Valid @ 8 AM MST Monday, February 1, 2016. 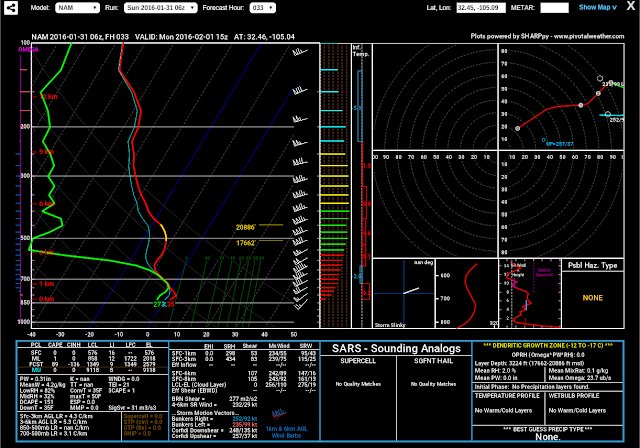 From The Surface Up Through 100 MB (53,000' Mean Sea Level/MSL). 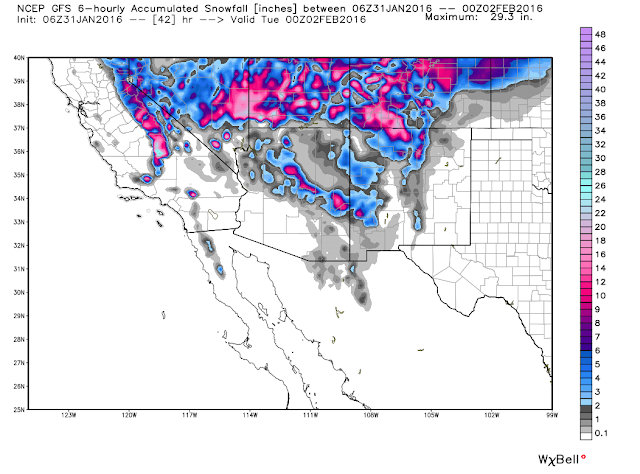 Valid @ 11 AM MST Monday, February 1, 2016. Monday has the potential to be one of those days that goes down in the history books as far as high winds, blowing dust, and the extreme fire danger is concerned. Looking at the NAM forecast model graphic and sounding above we find that by Monday morning the winds aloft over southern and southeastern New Mexico as well as parts of West Texas will be really strong. In fact 50 knot winds or 58 mph winds are forecast for the 850 millibar or 5,000' level. At 700 millibars or the 10,000' level these winds increase to 85-90 knots or 98-104 mph. 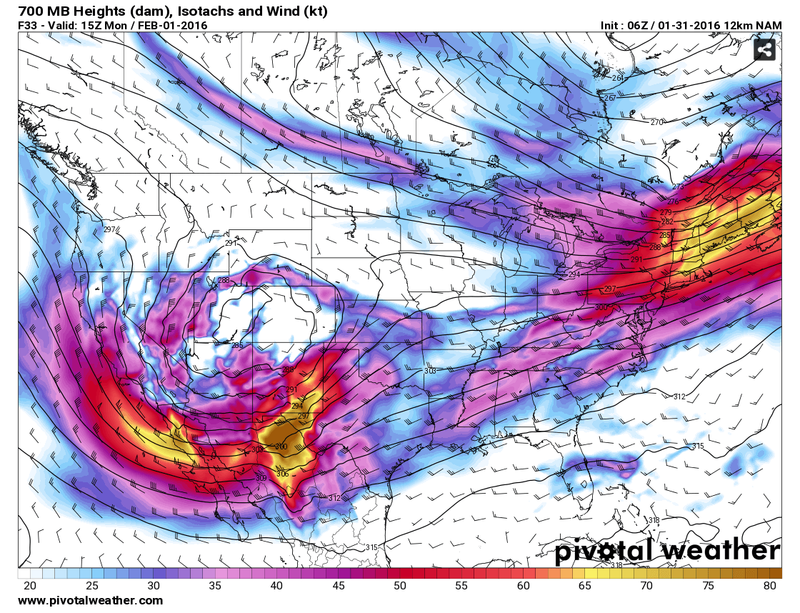 By the time we get up to the 500 millibar or 18,000' level a strong jet stream is found with 120 knot or 138 mph winds. These extremely strong winds aloft will mix down to the surface, aided by a tight surface pressure gradient, and approaching cold front, all will combine to make for a bad day weather-wise on Monday. 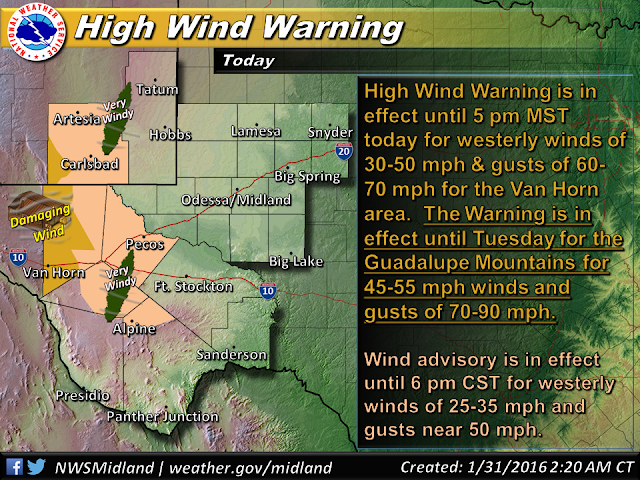 Damaging southwesterly winds sustained at around 40-60 mph with gusts to near 80 mph are forecast for the Guadalupe Mountains of Eddy and Culberson Counties today. These winds are forecast to back off somewhat tonight and become sustained at around 30-50 mph with gusts near 65 mph. 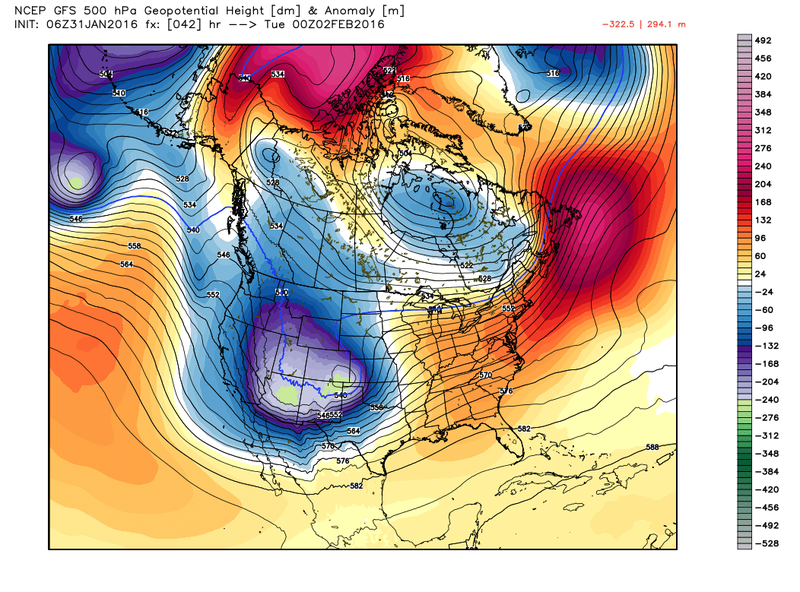 Monday into Monday night they howl furiously out of the southwest sustained at 50-70 mph with gusts to near 90 mph. Tuesday won't be much better either with westerly winds sustained at 30-50 mph with gusts near 70 mph. A Wind Advisory remains in effect for Eddy and Culberson Counties today for southwesterly winds sustained at around 25-35 mph with gusts near 50 mph. A Wind Advisory remains in effect for Southwest Chaves County and Lincoln County through tonight for southwesterly to westerly winds sustained at around 25-35 mph gusting up to near 50 mph. A High Wind Watch is in effect for Eddy and Culberson Counties on Monday for southwesterly winds sustained at around 30-50 mph with gusts to 70 mph. A High Wind Watch is also in effect for Lea County and parts of West Texas on Monday for southwesterly winds sustained at around 35-45 mph with gusts to 60 mph. A HIgh Wind Watch is in effect for Chaves and Lincoln Counties for Monday for southwesterly to westerly winds sustained at 35-45 mph with gusts to 60-70 mph. A High Wind Watch is in effect for most of southern New Mexico and parts of West Texas for Monday for southwesterly to westerly winds sustained at 35-45 mph gusting to 60 mph. Blowing Dust May Cause Travel Problems Monday! Areas of localized blowing dust may develop today especially during the stronger wind gusts and over those normally dust prone locations such as: freshly plowed or exposed farmlands or fields, lots, and construction sites. 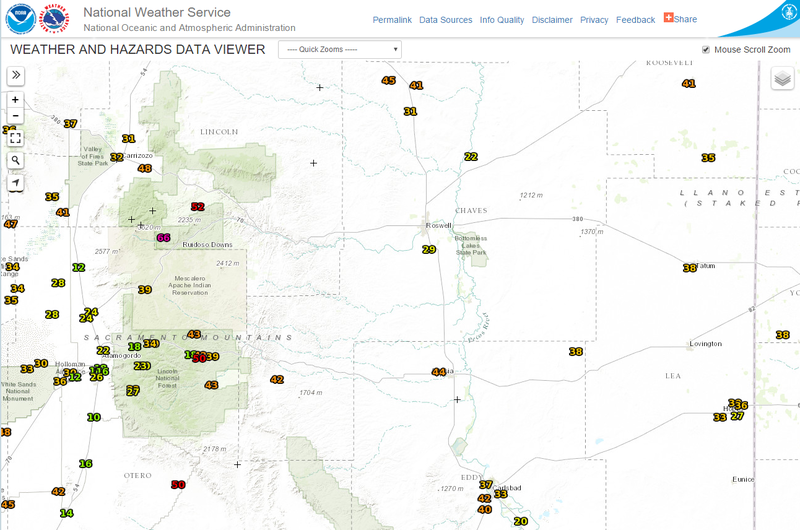 Widespread blowing dust appears likely for many areas on Monday from southern New Mexico northeastward into southeastern and eastern New Mexico and across West Texas. Sudden drops in the visibility down to zero will certainly be possible especially in dust prone areas experiencing wind gusts of 50-90 mph! There could be some road closures due to these high winds and blowing dust. 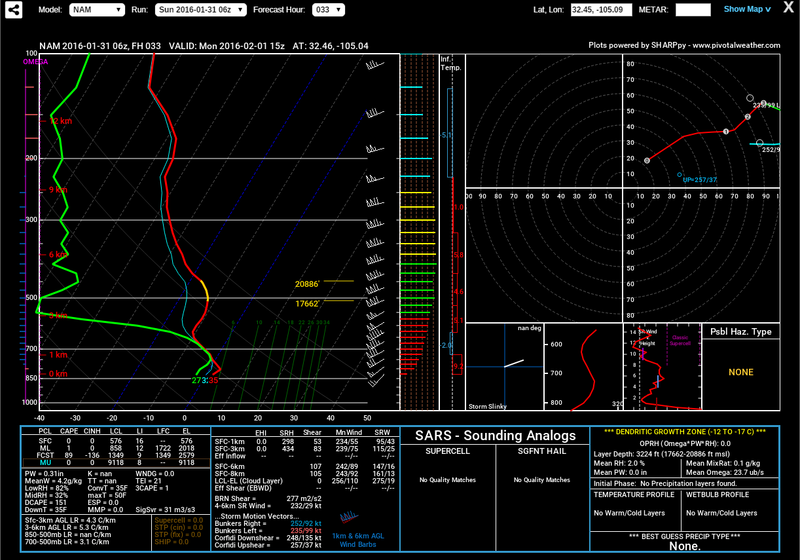 With a area wide high event forecast to unfold on Monday do not be surprised if there are not some power outages. Power lines, power poles, other high lines, tree limbs, and roof shingles may all be prone to being blown down on Monday. Some small sheds and outbuildings may also suffer damage or be blown down. This also applies to agriculture irrigation sprinkler systems. Some west facing windows may also be blown out in the stronger gusts of 70-90 mph. 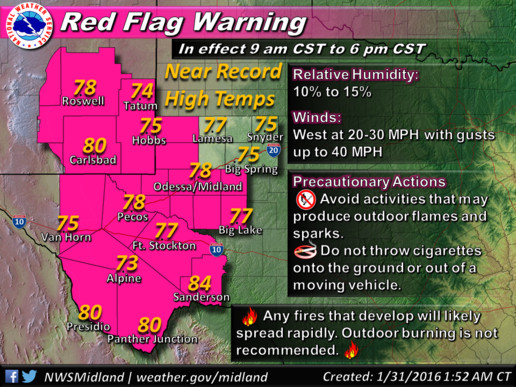 Critically Dangerous Fire Weather Conditions! 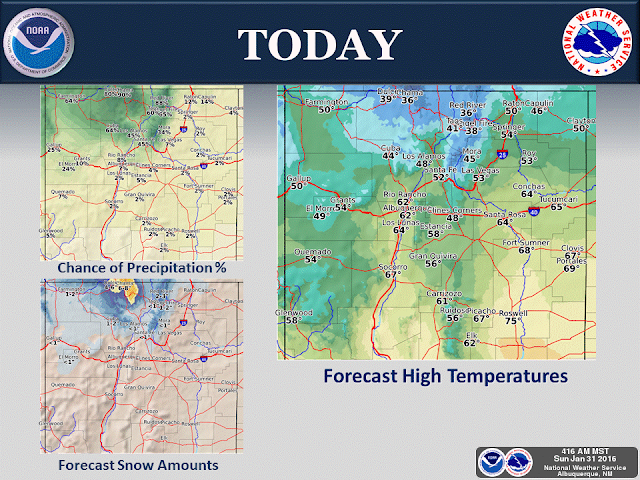 Red Flag Warnings and Fire Weather Watches continue in effect today into Monday for the local area. Given the very warm temperatures expected today and Monday, the high winds, and a very dry airmass in place, it won't take much for an outdoor fire to rapidly spread and grow. Please avoid any type of outdoor activity that involves the use of sparks or flame...especially on Monday. NDFD (NWS) Accumulated Snowfall Forecast. Valid @ 5 AM MST Wednesday, February 3, 2016. 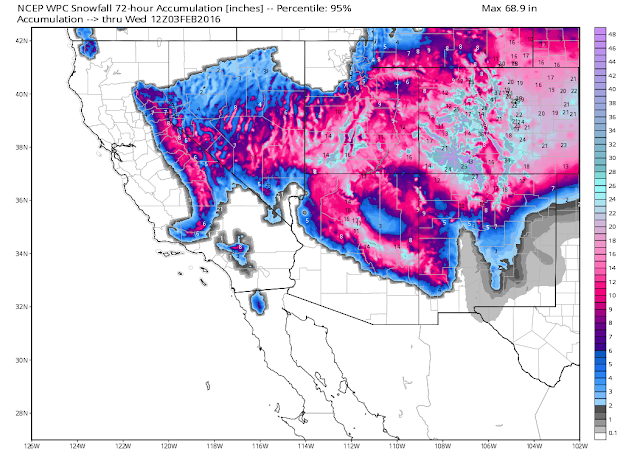 Please visit the El Paso/Santa Teresa and the Albuquerque NWS Web Pages for the latest Winter Storm Watches, Warnings, and Advisories.